Good morning, readers! 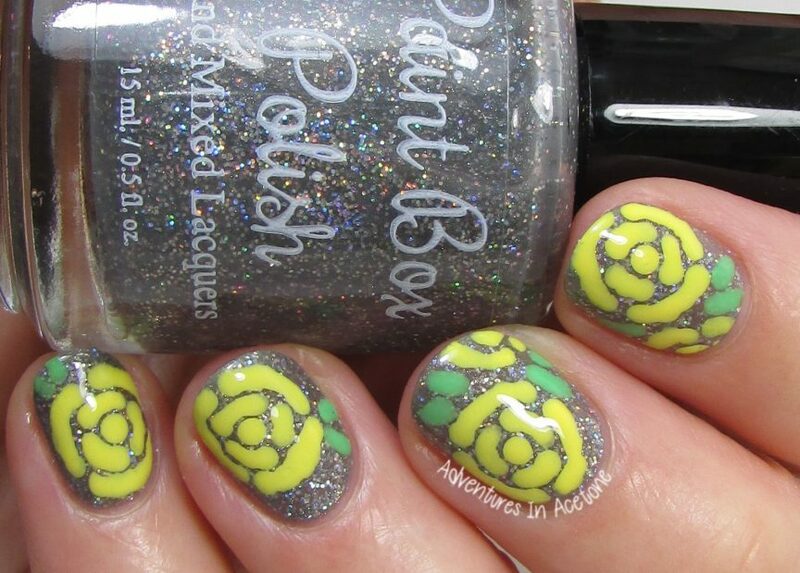 This week’s 40 Great Nail Art Ideas prompt is Yellow + Silver, so I’ve combined them in an abstract rose nail art manicure! 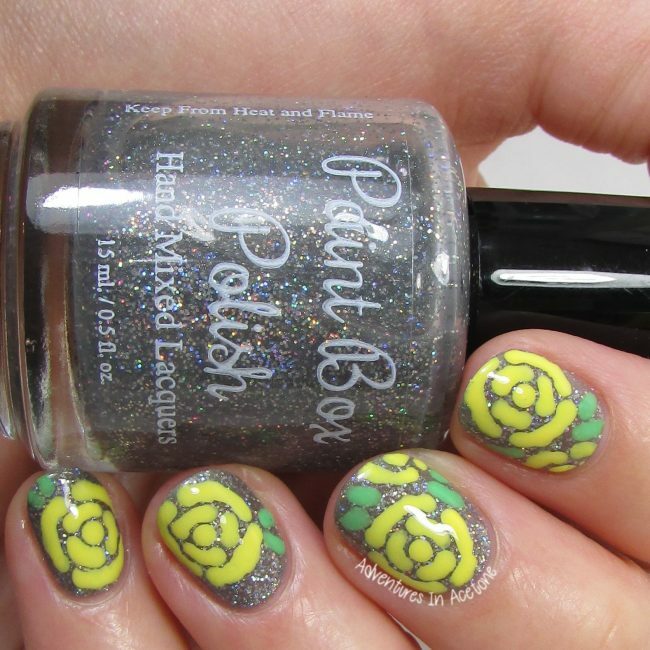 I found a really easy to use tutorial for these roses by Lindsey of Wondrously Polished in the book Pretty Hands & Sweet Feet. I’ve not had huge luck in the past with free hand roses, and typically go for different florals, but I was happily surprised with how these turned out! The yellow offsets the silvery grey of Paint Box Polish Winter Is Coming perfectly, and all I used was a dotting tool. I started out with a base of Paint Box Polish Winter Is Coming from the recently released Westerosi Collection. Once that was dry, I followed the tutorial in the book I linked above, using a dotting tool and OPI I Just Can’t Cope-acabana and OPI You Are So Outta Lime! I topped the manicure with KBShimmer Clearly on Top to seal in the nail art and help with dry time. *There are affiliate links in this post. If you click on them, it supports this blog. 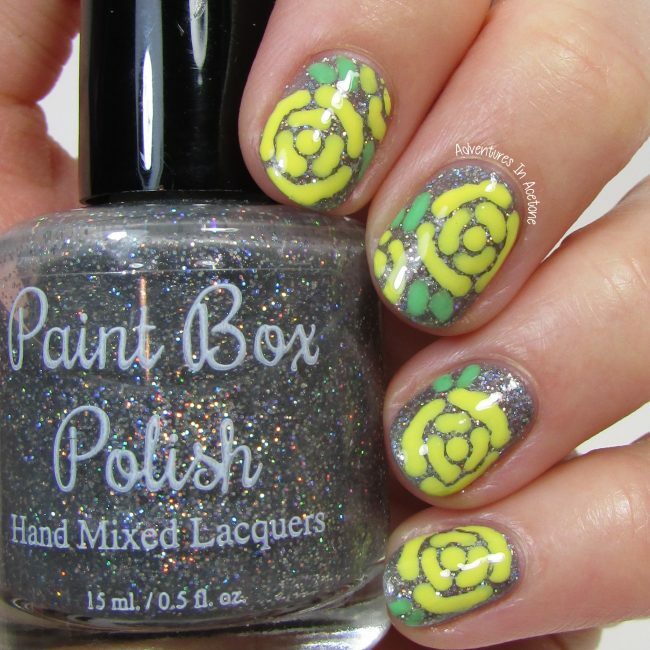 Ooh this is such a gorgeous mani, I love the colour combo & the yellow rose is so cute. I need to do some in that way. I love the combo of grey and yellow, so pretty!